The story of Judith is one of those which can always be found in the Bibles of the Catholic and Orthodox but very rarely in those of the Reformed tradition. There are complex historical and theological reasons for this which it would exceed my knowledge base to go into. What I can say is that although the early Reformers had doubts about the canonical status of the Deuterocanonical books, as they are called, including Judith they nonetheless continued to make use of them. The classic King James Version of the Bible, for example, included her story in full. And the Church of England Book of Homilies issued in the 16th Century to expound the Reformed doctrines contained in the 39 Articles made frequent reference to these 7 books to reinforce their arguments. It is only later generations of Protestants that began, more or less without debate, to edit Judith and her companions out of the picture. I often feel when reading her story that if I had encountered it as a teenager then my interest in religion would have started a whole lot earlier than it did. It has so many great elements. It is mercifully short. It features war, battle, siege, seduction and drunkenness and in Judith a feisty heroine who is glamorous, willing to wield a sword with the boys and no mean military strategist. Absolutely none of which interested the theologians and commentators who have written about Judith over the centuries. In keeping with Catholic tradition the chief thing sought when reading the Old Testament is the ways in which it foreshadows the New Covenant. Events and persons are considered as being types or allegorical symbols of events and persons that reached their full significance in Gospel times. Men like King David or the Prophet Jonah are seen as types of Jesus and women like Rachel and Esther as types of Mary. In that sense Judith is a typical woman since in her, the theologians argue, we can see a type or figure of Mary. However that might be, my interest here is to consider, via the figure of Achior the Ammonite, how Judith exemplifies the manner in which devotion to a handmaid of the Lord is not a diversion from worship owed to God but a super-highway towards it. Achior belonged to those who were traditional enemies of Israel. He was aware of their religion but did not share it. Holofernes, to whom he was a reluctant ally, banished Achior to the Israelite town of Bethulia for daring to suggest that the God of Israel might, in certain narrowly defined circumstances, prove stronger than the King of Assyria whom the Assyrian hosts considered to be the only God upon earth and with power over it. Achior was doomed to share the fate of the Israelites, when the earthly God crushed the heavenly one then he would die alongside those who had vainly put their faith in the God of Jacob. 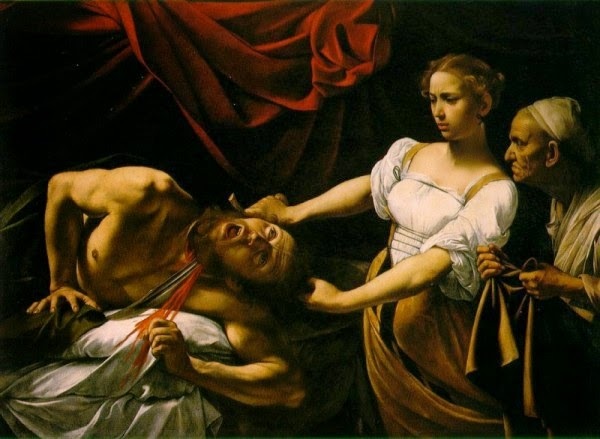 When therefore Achior saw the severed head of Holofernes and learned that he had died by the hand of Judith he realised that he had escaped from death because the God of Israel had acted through the agency of this heroic and virtuous woman. He fell down and showed her reverence and because of her he converted to Judaism. Here then we have a perfect illustration in type of the value of Marian devotion. Many people, and especially from those Christian traditions which have edited out the Book of Judith, think that by giving praise and honour to Mary we lead people away from Jesus yet Achior perceived instinctively that by praising with due praise one who perfectly fulfilled the role God had chosen for her he was thereby giving honour to God. All the reasons that Catholics have for honouring Mary stem from her relationship with the Blessed Trinity and above all her Son, the Logos of God, Jesus Christ. We cannot contemplate her without contemplating Him and we cannot honour her without honouring Him. Yet there is this difference, Mary is one of us, the human and only human daughter of a human mother and father. She is Our tainted nature's solitary boast as Wordsworth put it. She is not divine nor is she charged with the task of being our Judge. A great many people have no fear of Jesus and no sense of distance from Him and can pass in and out freely through His gate finding pasture (John 10:9) Yet we are not all the same, some, and it may be the more humble among us, do see the great distance between themselves and Jesus or they see deeply inside themselves just how much they deserve the judgement and ought to fear the judge. For these the Church offers Mary as the ladder which will lift us up gently and lovingly to Him. After all, the Jews did not need Judith to convince them to believe in Almighty God but Achior did. It is the task of the Church to save the Achiors of this world every bit as much as it is to save Jews (metaphorically speaking). And Mary is that Blessed Woman who leads many to salvation by being the most sweet mirror of her Son.